0.50 BMG weapon shock and recoil. Based around common core electronics, signal processing, and infinity focused large-format collimating eyepiece, theX25 Pro Series Day/ Night Clip-on Thermal Imaging Device is available in a variety of options and price points that cater to every application – military and commercial. The X25 Pro is a solid state, uncooled, long-wave infrared, 1X (unity magnification) Clip-on Thermal Imaging Device for day and night engagements. It mounts directly in front of the variable magnification sniper day sight without the need to remove the day sight from the weapon. 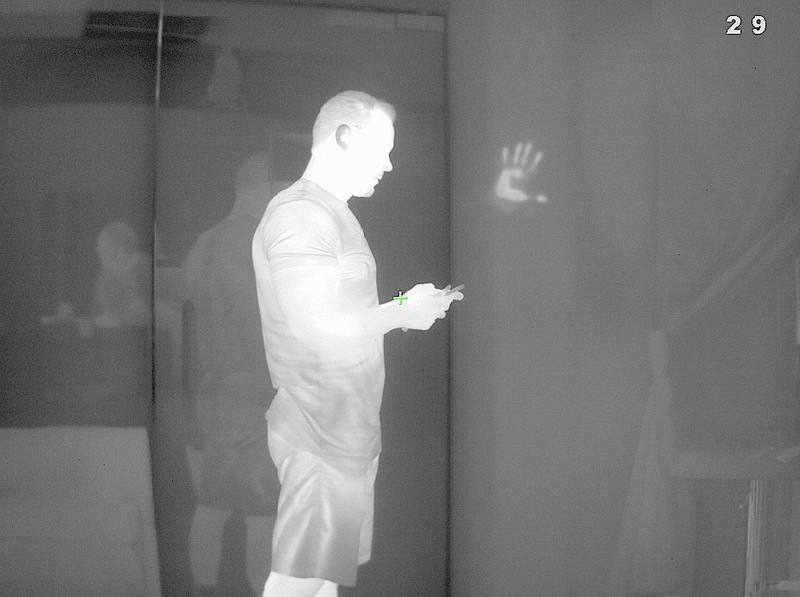 Collateral applications of the X25 Pro Thermal Imaging Device include functionality as a unity magnification (1x) stand-alone weapon sight and handheld uncooled thermal monocular. 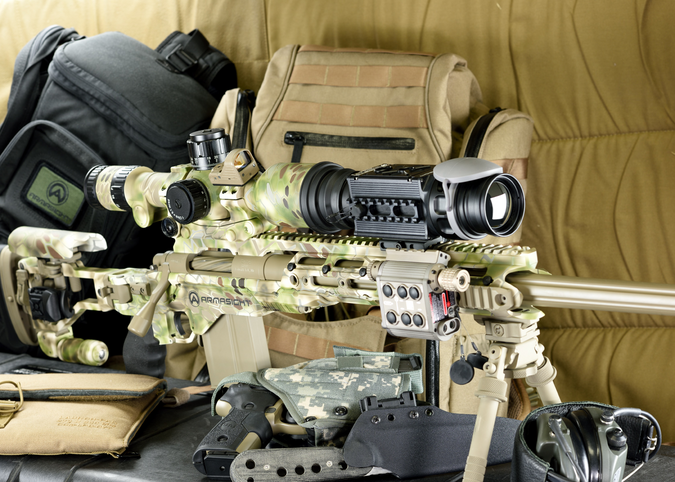 For the collateral duty functions, SPI has included a compass and inclinometer in the X25 Pro package for finer range estimation and target orientation. A five-button wireless remote switch is included to operate and modify the settings on the X25 Pro to optimize the imagery for the viewed scene without having to remove your hands from the weapon. The X25 Pro has Bluetooth© wireless capability and can directly interface with most smart phones with the potential for engaging a series of current and future applications. 100mm Germanium (Ge) objective lenses, creating a wide variety of range performance options optimize the user’s experience with this magnified day sight. SPI has introduced a unique dual battery option for the X25 Pro Clip-on Thermal Imaging Device, consisting either of four 3.0VDC 123A batteries (all oriented in the same direction to prevent confusion in replacement), or four 1.5VDC AA batteries pre-loaded in a cartridge. In a pinch, the X25 Pro special power-management feature allows the use of a single 3.0VDC 123A battery for just over an hour. The X25 Pro uses the same 9-pin multi-pin connector to provide video-in imagery, where there may be a need for map or rangefinder display overlays, and external power access. 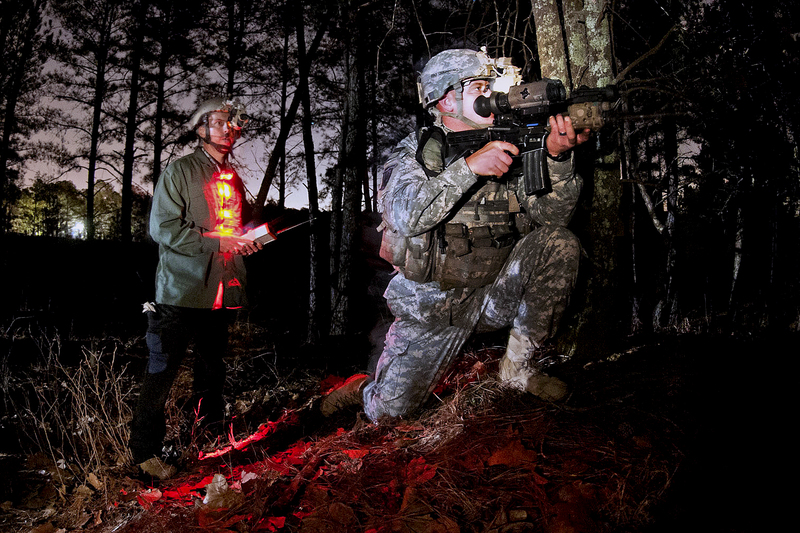 In support of these capabilities, SPI offers an optional laser range-finder, external battery pack, multispectral laser and other accessories designed to attach on the MIL-STD-1913 rail of the X25 Pro to feed the desired overlay or input power into the Clip-on Thermal Imaging Device. The 9-pin connector is also capable of providing a portal for periodically upgrading the X25 Pro software directly; as new revisions become available, users can download updates directly from the internet. X25 Pro weapon installation is easy, repeatable, and reliable based on a user-friendly MIL- STD-1913/ Weaver/Picatinny rail compatible, quick-release locking mechanism. This device is normally used in the “Reticule Off/ No Reticule” mode. However, when used in the collateral role of a 1X stand-alone weapon sight, the solid state technology reticule adjustments and software algorithms — combined with a complementary color reticle platform — ensure maximum reticle contrast, high-level target accuracy, and boresight retention that cannot be achieved with mechanical boresight adjusters and traditional ballistic drums. This level of accuracy is translated into the tracking electronic zoom (e-zoom) function of the X25 Pro, when used as a 1x weapon sight, which can be progressively increased from 1x to 2x to 4x and 8x (640×512 format only) without changing the point-of-aim to point of-impact relationship of the targeting reticle. Based on its superior price-to-performance value, the X25 Pro Clip-on Thermal Imaging Device represents the most versatile and sophisticated product available in today’s market for hunters, SWAT teams, and military personnel who want to use their own sniper day scopes.